I am such a sucker for the absurd games. 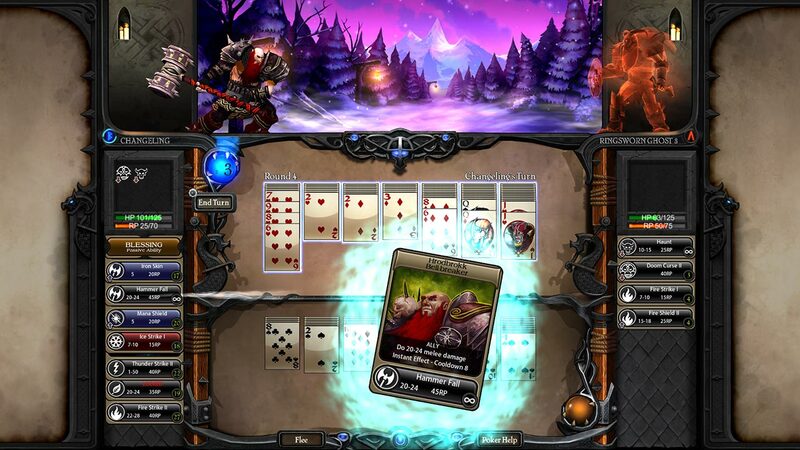 Take Runespell: Overture for example: It’s a game that combines the grind and fantasy of an RPG with the luck and fortune of poker. Somehow, believe it or not… it actually works out fairly well. You get to move any combination of your cards (on the top) to any other stack of your cards in the hopes of creating a hand (like a pair, flush, or straight). Adding some strategy to the mix, you only get three moves before your opponent gets a go. Making things even more interesting, however, is the ability to take cards from your opponents side. On your turn you can take a single card from your foe and put it on your card stacks. 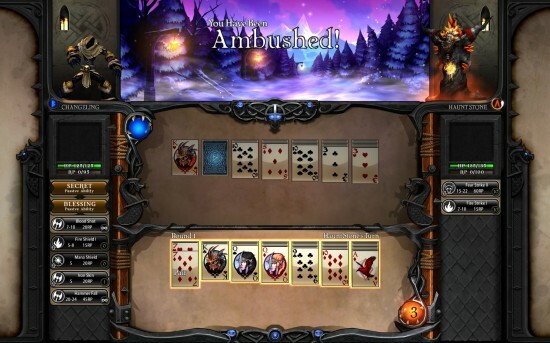 You cannot, however, take a stack of cards from your enemy, so you can’t steal their straight and use it as your own. This makes the game incredibly fast paced and more strategic: Should I take his card to create my 4-of-a-kind or do I just attack with what I have? It’s a fun formula, and you’ll develop your own techniques quickly. 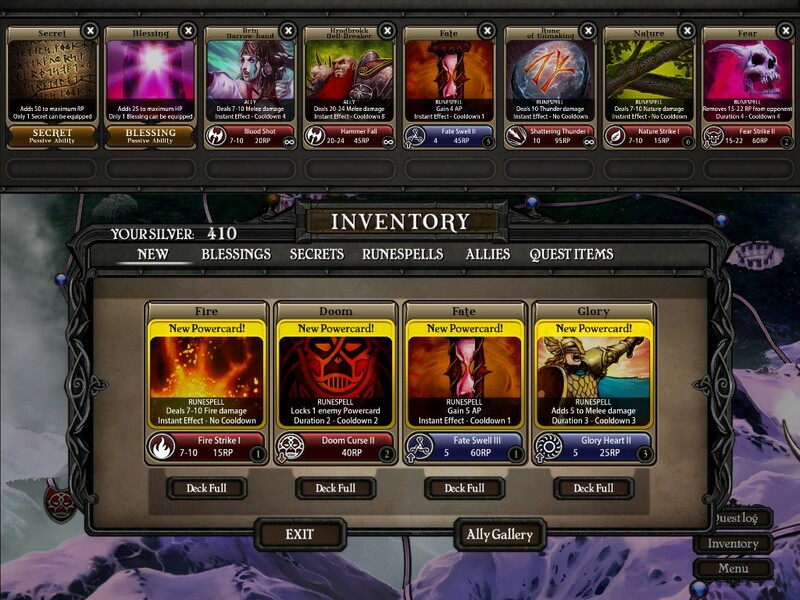 It wouldn’t be a fantasy RPG without spells, and as the name suggests, Runespell: Overture has plenty. As you attack and defend you’ll gain Rune Points which can be used to cast the titular runespells against opponents. These spells range from allies helping you in battle and throwing fireballs, to shields to protect against magical damage and even spells that give you more turns. The runespells themselves add the most flavor to the game, as you can only have seven equipped at a time, and mixing it up to beat your foes may be the best solution instead of going headfirst into the fray. Knowing when to hold and when to use can make all the difference in the fight. The game isn’t all sunshine and happiness however. A few things hold the game back from being great, namely the ridiculous luck you need to win some battles. This probably comes as a given seeing that poker itself is a gamble, but getting the cards you need in a clutch is near impossible. I had many frustrating restarts simply because of a five or six turn dry spell in which my adversary annihilated me. Fortunately if you simply keep retrying the luck will fall your way eventually, which doesn’t make for a good strategy game. This is a big complaint from me: Strategy games should be just that – all about strategy. When too much luck is thrown in the mix things don’t work as well as they should. While it is intrinsic in the game of poker, reliance on luck shouldn’t be what progresses your forward in a strategy game.